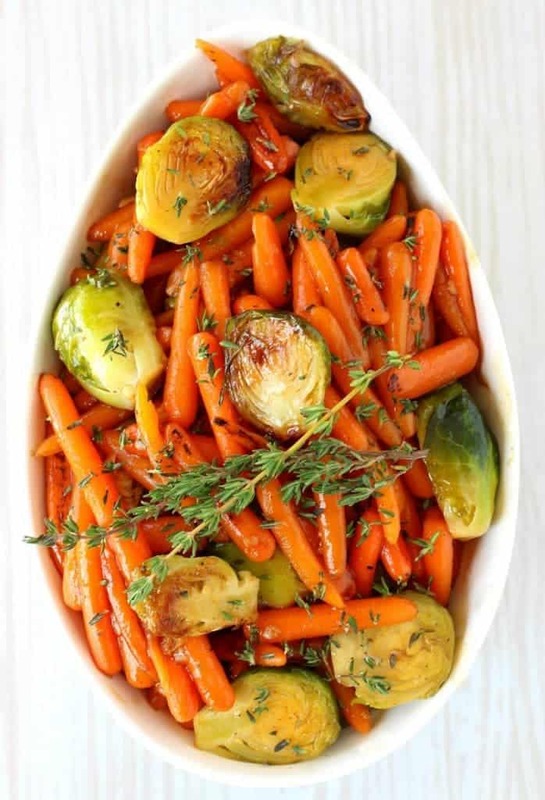 Whiskey Glazed Baby Carrots and Brussels are hitting your table! 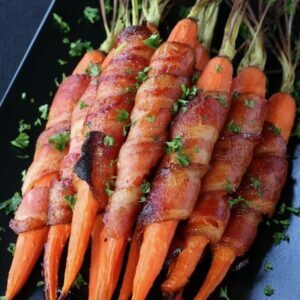 Make them for Easter dinner – or any dinner – everyone will be asking to pass them over! We just can’t get enough of this whiskey glaze. It just makes everything you put it on taste so much better! When it comes to side dishes for the Holidays…people seem to get stuck in ruts by making the same recipes over and over. Don’t get me wrong – tradition is awesome. 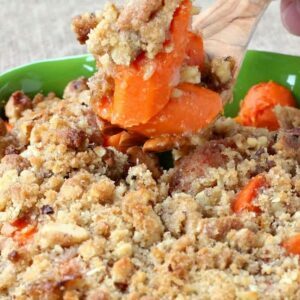 I love having family recipes that are standards at our holiday table and we do have a few of those. And rolls. You’ve got to have rolls. Even though everyone in our family forgets to put the rolls in the oven AT EVERY DINNER…we wait. Because you’ve got to have rolls. The ones that just wouldn’t be a Holiday without them…but then I think you need to throw a few in there that are different just to switch things up a little. 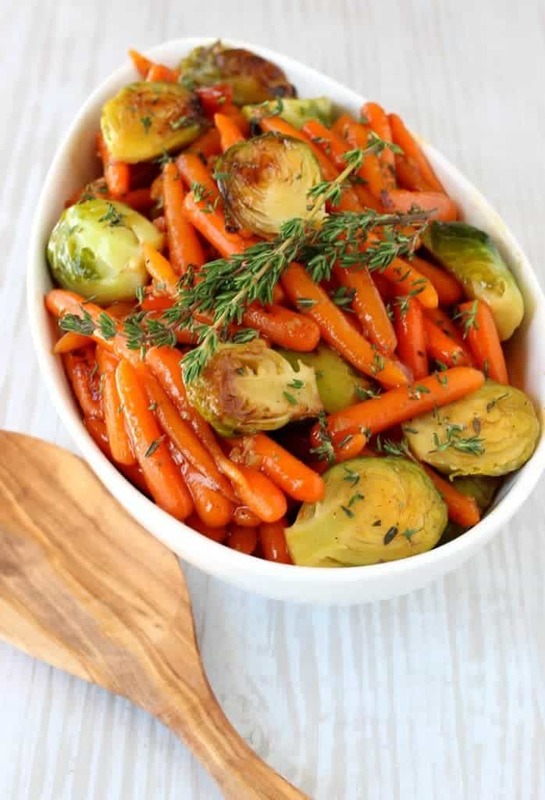 These Whiskey Glazed Baby Carrots and Brussels are definitely that recipe. There’s a few side dish recipes that are in our new routine for holiday dinners that I think tend to steal the show like this Roasted Broccoli with Buttery Bread Crumbs or this Brown Butter and Thyme Torte. We even have a recipe for Fried Brussels Sprouts with Whiskey Glaze…but for this one, we kept the frying out of the picture. 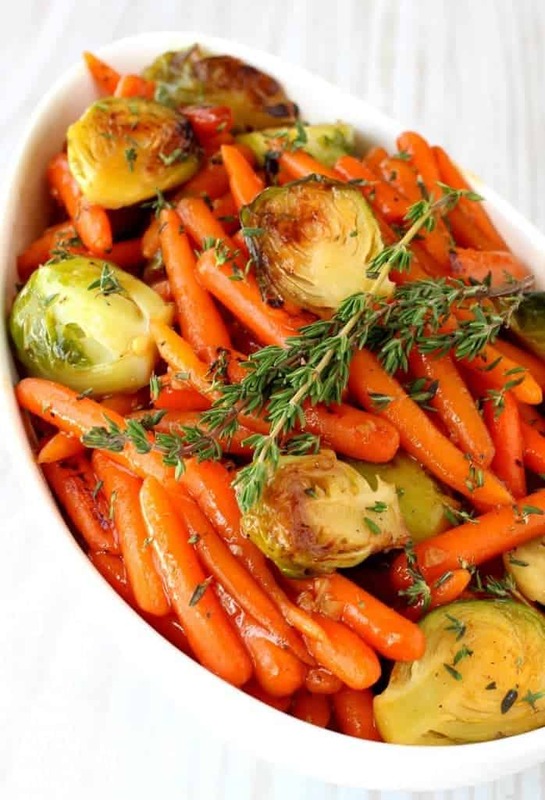 This Whiskey Glazed Baby Carrots and Brussels recipe couldn’t be easier to make. It’s a stove top recipe so when your oven is full you don’t have to worry about getting another side dish in there at the last minute. A bonus, too – this recipe can also be made ahead of time and heated up in the microwave or back in a skillet right before dinner, so there’s that. Everything that can be made ahead of time for the Holidays is an OK recipe by me. 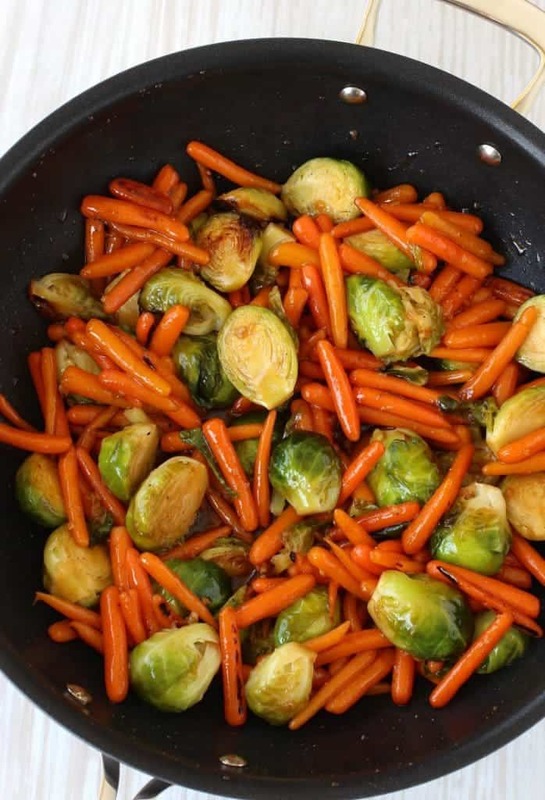 Just grab a large skillet and throw in some olive oil to start cooking the carrots and brussels sprouts. Season them with just salt and pepper and let them cook for 15 minutes until they’re tender. You’re going to need a skillet with a lid for this so you can cover them and let them steam, if you don’t have a lid you can cover the skillet with heavy foil just to let the steam build up. 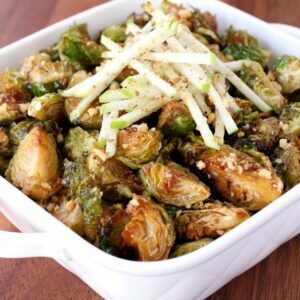 Once the carrots and brussels are done, pour the whiskey glaze on top and toss to coat. 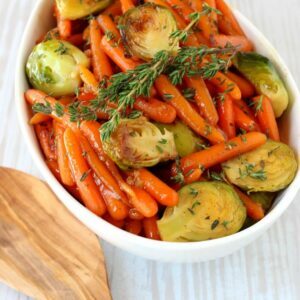 Whiskey Glazed Baby Carrots and Brussels is side dish that everyone will be wanting the recipe for on he next Holiday! Make the whiskey glaze by heating up the oil in a medium saucepan. Add the garlic and cook for 30 seconds, then add in the rest of the ingredients except for the whiskey and cornstarch mixture. Whisk together and let cook for 10 minutes, simmering. Remove the pan from the heat and carefully pour in the whiskey. Stir and let cook for another 5 minutes, then bring back to a boil and whisk in the cornstarch mixture. Let the glaze come back to a boil, reduce the heat and let simmer for 5 minutes to thicken and then remove from the heat. In a large non-stick wok or skillet, add the oil and heat over medium high heat. Add the carrots and brussels sprouts to the pan and season with the salt and pepper. Stir and cover, cooking for 15 minutes but stirring every 5 so tat the vegetables don’t burn. When the vegetables are tender, pour 1 1/2 cups of the whiskey glaze over and stir. You won’t need all of the whiskey glaze so save some for another use! Garnish with fresh time leaves and serve. After the vegetables cook for 15 minutes check to see if they’re tender If they’re still to firm, cover and let cook another 5 minutes. What an amazing side! I can’t wait to try! Thanks Madi, let me know if you do! These are fabulous! I LOVE the glaze! The glaze is so good, you have to try it! Those veggies look great and that glaze sounds amazing!